You can’t get more Mancunian than the Metrolink. Metrolink is the light rail transport network of Manchester that the city relies upon. One thing it absolutely gets right but is often overlooked and covered with adverts is the branding. Photo by Mike McNiven from Flickr. Manchester Metrolink Tram in St Peter’s Square with 25th anniversary livery. 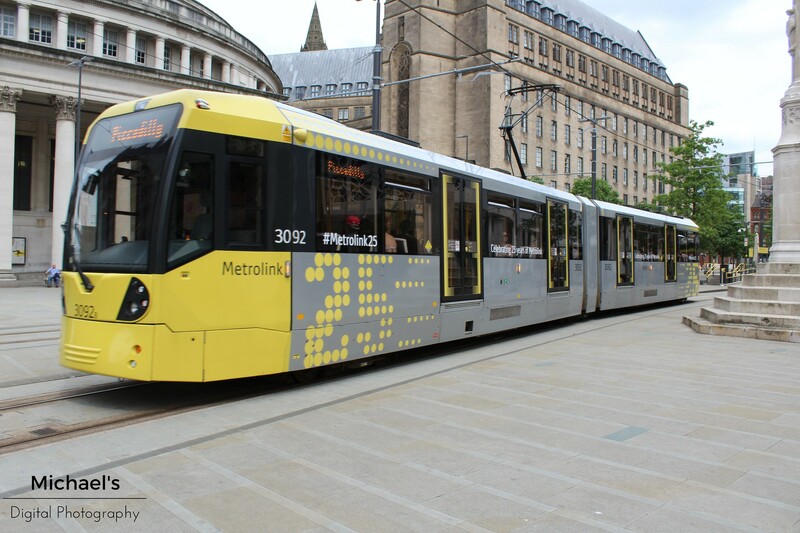 In 2008, design and marketing consultancy Hemisphere created a new brand and design guideline for Metrolink and just in time for 120 new and shiny M5000 trams from Bombardier, replacing the fleet of old and failure prone T-68 vehicles. The aim was to present Metrolink in a new light as an attractive, reliable, and convenient way to travel. This was also a moment of changing ambitions as The Met went from an experimental and small network to one that would double in size. This new brand was comprehensive, everything from the staff uniforms to the tram liveries had been thought of, designed and specified with impeccable attention to detail. The new brand features the main colours of custard yellow and light silver- reflecting the city’s optimism and no doubt its clouds. On the tram livery, the entire front section is pale yellow, with graduated yellow circles that blend into the silver of the main body, carrying a feeling of momentum and moving forwards, using black glazed sections in-between windows to create a black band running the length of the vehicle. Only twice on each vehicle is the word “Metrolink” used, so iconic is the branding they obviously didn’t feel the need to plaster the word all over. So thorough was the rebranding it included its own font, Pantograph Sans which you can see on the TfGM website. Like Manchester and the service they aim to provide, it’s a clear, no-nonsense, friendly font. Everything on Metrolink and infrastructure uses it including the system map, posters, information signs, printed material, even safety notices. This is to me, one of the key successes of the brand, it unifies the whole system with a clear visual identity that leave no doubt to anyone as to what it is. A key part of the brand is encouraging people who don’t use the system to get on board. The signage, cohesive branding, simple ticketing, easy payment options and clear map makes it easy to figure out how to get where you want to be; just turn up and go. After a couple of years without coloured lines on the map, they’re back and now with numbers at the start and end of each line that indicate a link with a rail station, transport interchange, or key development further attempting to unify transport in a city that still suffers from fragmented transport. The branding extends to platforms too – the stops and shelters all continue the brand, with yellow signage, yellow handrails, Pantograph Sans everywhere and bright lighting. All stations are marked by illuminated, bright yellow signs, clear and unmistakable markers that you have arrived somewhere maintained, active and available, and that you are only a short distance away from where you want to be. Almost all stations, regardless of their location and age, carry off the branding well. Arguably the worst stop on the network is Cornbrook with its creepy side street entrance built into arches amongst scrapyards and a collapsed pub, but even there you have no uncertainty that you have arrived at the right place, that it’s in use, open and maintained. The old High Street tram stop with old branding and half-length platform. While looking for photos of the old branding I came across this one and shows one of a few half length platforms in the city centre, with the old trams having to use their retractable steps for access, all of which have since disappeared. All Metrolink platforms are the same height, and fully accessible to those needing wheelchairs, in part due to the network re-using old British Rail lines abandoned in the Beeching Cuts. One of the major failings of public transport in the United Kingdom outside of London is that it is seen as a distress purchase, something you only use if you have no other choice. As an example, think of almost any local bus service run by one of the big companies. When rebranding Metrolink, Hemisphere had to ensure the brand didn’t look like a distress purchase, asserting that Metrolink is serious, reliable, and something people want to use. Garish colours, tacky graphics and silly fonts were a no-go, it had to be understated and quietly joyful. It’s also quieter, faster and cleaner than loud, slow and dirty buses. Metrolink runs on green energy, with 62% of it’s electricity coming from wind power, and is something it could shout about a bit more. When you’re on board, the service generally is top notch – even a slight delay of a minute or two is accompanied by a polite announcement and apology from the driver – the whole package works well together. Metrolink is an attractive way to travel around the city and to the suburbs. Photo by Mike McNiven on Flickr showing the Pride tram. 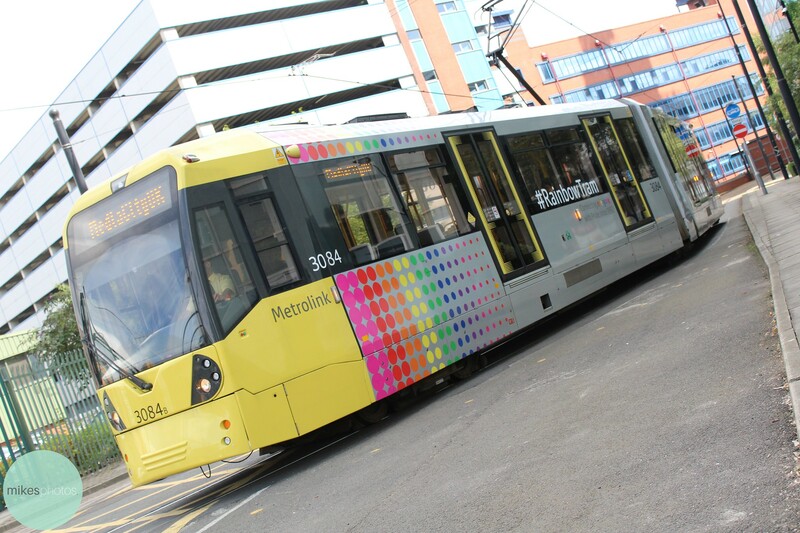 TfGM take pride in the city often producing livery variations, such as the Pride tram, the Gold tram for the Olympics, and the unifying Manchester Bee tram “Spirit of Manchester” following the awful attack at the Manchester Arena. This interaction of the brand into the pride of the city furthers the relationship that Metrolink is Manchester and not just another mode of transport. And it isn’t perfect by far – the smart ticketing is a total mess, when things go wrong they often go very wrong, and just occasionally trams bump into each-other. But the branding carries it off. It’s iconic.